Caz students turn the opportunities offered by Cazenovia College into achievements. We are celebrating these achievements in a new way, through personal student Merit pages! All students now have a personal Merit webpage to display their accomplishments and show off their digital badges. Caz students earn badges for participation in clubs and sports, academic achievement, leadership, international study and more! Cazenovia College also shares our students’ achievements with their hometown newspaper and high school administrators through personalized press releases. As Caz students progress through their academic studies at Cazenovia College, their Merit page becomes a showcase of all their achievements at Caz. The Merit page becomes a valuable tool for students as they apply to graduate schools and/or move directly into professional employment. Merit pages are backed by the College and display a “Verified by Cazenovia College” stamp on all college-issued achievements. We are proud to have you as a student, and we can't wait to publicize your success! Why is Merit important for Caz students? How do sign in to my Merit page? How do I download the Merit app? How do I suggest a contribution to a student’s Merit page? Who do I contact with questions about Merit? How do I opt out of Merit? Merit badges recognize the great work our students are doing. 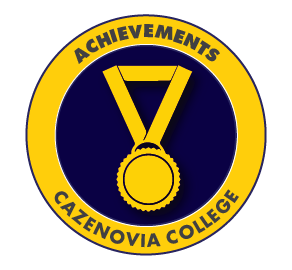 Cazenovia students earn badges for participation in clubs and sports, academic achievement, leadership, international study and more. All badges published by the College to personal Merit pages receive a "Verified by Cazenovia College” stamp. In addition to the badge on your personal Merit page, Cazenovia College also shares your achievements with local media in your hometown. Your Merit page also makes it easy for you and your family to share your achievements by simply clicking the embedded social media icons. Digital badges are a great way to show off your skills, achievements and academic success. Not only is it fun to earn badges and let them do the bragging for you on your social media pages, it is also a way to show off skills and involvement. Badges have become a popular way for employers to learn more about you beyond your resume. Since Merit badges awarded by the College receive a "Verified by Cazenovia College" stamp, they are backed with an institutional credibility neither your LinkedIn profile nor resume have. You can make your Merit page shine by adding a professional photo of yourself, photos of your achievements, and outline your work and internship experience. How do I sign in to my Merit page? Signing in to your Merit page is easy. Follow the instructions below to sign in with a web browser. Visit http://cazenovia.meritpages.com, search for your name, then click on the link to your page. Click on the “Is this you?” link under the profile picture and enter your cazenovia.edu email address. Check your Cazenovia email for a message from Merit with instructions to log in to your Merit page. Customize your page with your photo, your achievements, and your work and internship experience. Let the badges do the bragging! Share your Merit page with your friends and family on social media. 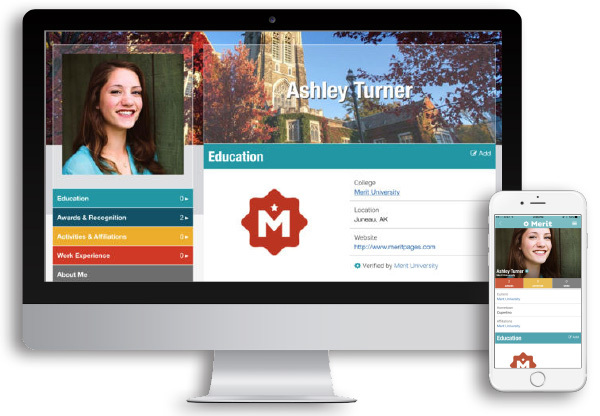 After students have signed in to their Merit page, they can easily maintain the page by logging in from a web browser, or using the Merit app. The app is available for Apple and Android devices. Just search iTunes or the Google Play store for “Merit Pages” or click the linked images below. We love to share stories about people, programs, and accomplishments by publishing them on Cazenovia College's student Merit pages. Merit is designed to showcase success at Cazenovia College by publicizing achievements like honors lists, participating in a club or activity, or studying abroad. If you have a suggestion for a Caz student or group of students you feel should be recognized, please share their story with us! Suggesting a contribution is easy. Just fill out our contribution form with as much information as you can. Updates look best with a photo, so be sure to add one if possible. After you submit your suggestion, we will review it, and may publish it on our Merit page. Anyone you tag in the form will also have an update posted to their Merit page. If you have questions about Cazenovia College’s student Merit pages, you can contact us at communications@cazenovia.edu. Our website content manager or a member of the Communications team will respond to your question. You can opt out of having a Merit page at any time, or keep your Merit page active, but adjust your privacy settings. The following links offer instructions from the Merit website. Not ready to show off your achievements through digital badges? You can choose to opt out of Merit by replying to the email notification you received about your new page, or follow Merit’s opt-out instructions.